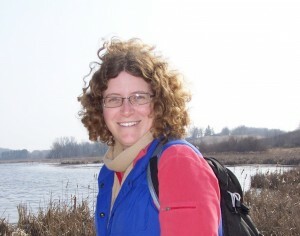 Michelle Niemann is the assistant director of the writing center at the University of Wisconsin-Madison for 2013-2014. Her first tutoring experience was in the writing center at Indiana University-Purdue University, Fort Wayne, in 2003 and 2004. She recently defended her dissertation and will receive her PhD in English literature from UW-Madison in May. Michelle bird-watching at Horicon Marsh in Wisconsin. Photo by Liz Vine. Tutoring in the writing center at University of Wisconsin-Madison since 2009 has given me a great gift: it has shown me the power of being interested. In anything, or anyone. In the next student signed up to meet with me and whatever project they’re working on. At the same time, as a graduate student in English literature at UW-Madison, I’ve also learned a lot about the corresponding power of being interesting. Being interesting is, quite rightly, the coin of the realm in advanced scholarship. And I’ve absolutely, nerdily loved the opportunity to pursue my interests in poetic form and sustainable farming by writing a dissertation about organic metaphors in both fields. But I’m also grateful that I’ve been working in the Writing Center, because tutoring constantly reminds me, and indeed requires me, to look up and notice at least some of the other interesting things going on around me. To be great tutors, we have to become interested in problems and questions we didn’t know much or anything about before a conference with a particular student began. While this open-ended curiosity is powerful in classroom teaching as well, tutoring encourages us to cultivate the habit of being interested because one-on-one, cross-disciplinary work disrupts the expert-at-the-front-of-the-room authority that teachers can fall back on. As tutors, we do draw on specific areas of expertise—about a variety of genres and their conventions, the writing process, and what makes for a strong application essay, for example—and we do have our bags of tricks, which include everything from good opening questions to strategies for drawing writers out to detailed handouts on APA documentation. But the improvisational part of tutoring—which is to say, the fun part—involves being interested: being curious about the student, their project, their discipline, the guidelines and constraints they’re working with, and what we each might learn or realize in the course of our conversation. For me, the best conferences—and they aren’t rare—are those in which I’m learning something that is of no practical use to me, something unrelated to my own scholarly work or to tutoring pedagogy. Something that’s just interesting. 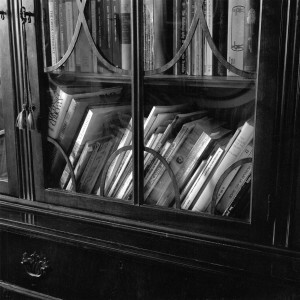 “Bookcase, Ruth Mendez Home, New York, New York, 2000.” Photo by Susan Carr. In documenting the homes of people who had lived in one house for forty years or more, Susan, my aunt, had to cultivate an open-ended curiosity about and interest in whatever she might find in each home she photographed. Graduate students have to learn how to make their work interesting, most especially to those in their subfields and more broadly to those in their disciplines. Being interesting for such audiences is a tricky feat because it requires both deep knowledge in a narrow area and innovative ideas or approaches. If your scholarly work is to offer anything to people who know as much as you do about Early Modern drama, say, or, in my case, twentieth-century American poetry, you have to be thoroughly grounded in that area, yet think flexibly enough to show your audience something new. But the essential requirements of advanced research in specialized fields encourage habits of mind that do not necessarily foster that flexibility—let alone complement our teaching mission. One such requirement is a laser-like focus on a specific question framed through sustained engagement with the literature of a subfield. If you have written a dissertation or are close to anyone who has, you’re probably familiar with the stage in any intensive research project where everything starts to seem related to your topic of study—for me, organic form in poetry. While it’s enormously rewarding—and fun!—to be in that focused and synthesizing frame of mind, I have not found that it makes me a great conversationalist. Open-ended curiosity—being interested—not only has the power to motivate the writer I take an interest in, but also has a salutary effect on me. It takes me out of myself and my project and my discipline, and, most importantly, reminds me that “interesting” is not a quality that resides in something, but rather that being interested is a capacity I have. It’s a capacity we all have, and can cultivate. If we practice being interested, we can become more flexible thinkers and more effective tutors. Of course it’s no surprise that writers respond well when tutors show interest in their work and their ideas: that’s a core principle of writing center pedagogy. But for our interest in a writer and her work to be pedagogically powerful, it cannot be perfunctory. We have to actually be interested, not just adjust our body language or exclaim a bit. I’ve found that questions I ask a writer out of curiosity—about herself, her purpose in a piece of writing, her ideas, her thinking—can help her figure out what she has to say, or even discover that she has something to say. If you’ve tutored in a writing center, you’ve probably found that you are sometimes more interested in a writer’s paper than the writer himself seems to be at first. If you’re lucky, your interest gives him permission to be excited about his ideas and to take ownership of them. It gives him a stake in a paper that’s about more than a grade. Graph by Elizabeth Wrigley-Field. 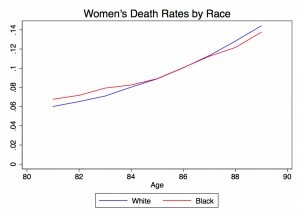 This graph shows a demographic phenomenon called the black / white mortality crossover. Though I do not know anything about the statistical methods she uses in her research, I’ve learned conceptually fascinating things through my meetings with Elizabeth in the writing center. I have found not only that my curiosity can motivate writers to articulate their questions and arguments more clearly, but also that a willingness to admit my ignorance can be pedagogically useful as well. When I’m working with a student who’s writing in electronic engineering, or educational policy, or demography, my ignorance can in fact be an asset to them. Backing up enough to explain to me even part of what I need to know to understand their writing can give such writers a radically different perspective on their work and clarify their thinking. 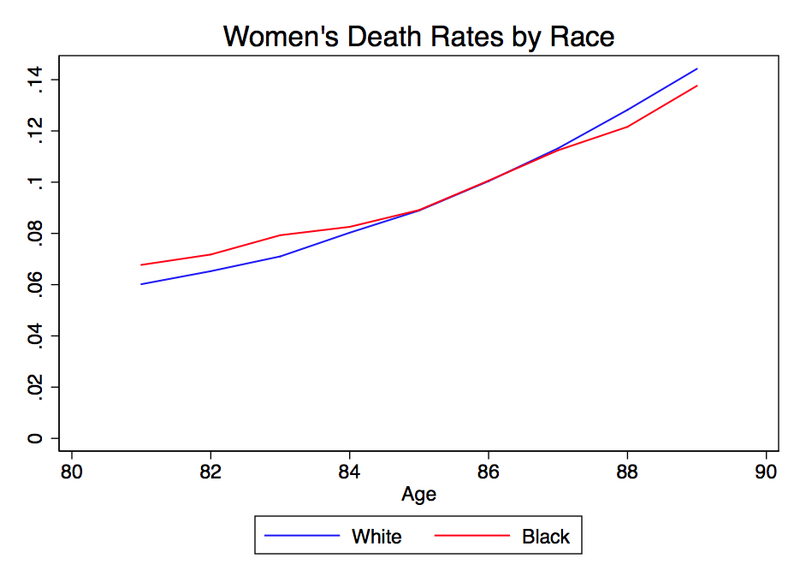 I’ve learned more than I have a right to know about what demographers call mortality selection—which, by the way, is really interesting—from Elizabeth Wrigley-Field (yes, that is her name—interesting as well! ), a graduate student in sociology with whom I’ve met on an ongoing basis for the last few years. And I think she would agree that she has learned a lot from explaining her work to someone who is completely ignorant of statistics. Admitting one’s ignorance and making use of it in tutoring requires confidence. 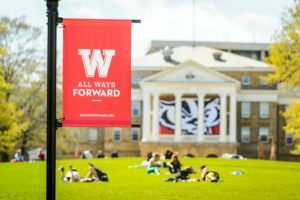 Like many beginning classroom teachers, I was anxious about my knowledge and authority when I began serving as a teaching assistant at UW-Madison in 2007. Needless to say, such anxiety did not make me comfortable with open-ended curiosity as a teaching tool. But when I began working at the writing center a couple years later, tutoring put me in a different frame of mind. Not having to worry about securing authority freed me up to use my ability to ask questions and my capacity to be interested to empower students. Curiosity can empower a writer not just once, but over and over again. I really enjoy working with Deb McFarlane, who came back to school after twenty years working in manufacturing to earn an associate’s degree, bachelor’s degree, and (very soon!) a master’s degree in Educational Leadership and Policy Analysis, and who studies lifelong learning—or, as she prefers to call it, free-choice learning. Deb always seems surprised when some new, clearer, more argumentative formulation of what she is trying to say pops out of her mouth while we’re talking—though now she has also come to expect it and to realize how much she can accomplish through conversation. 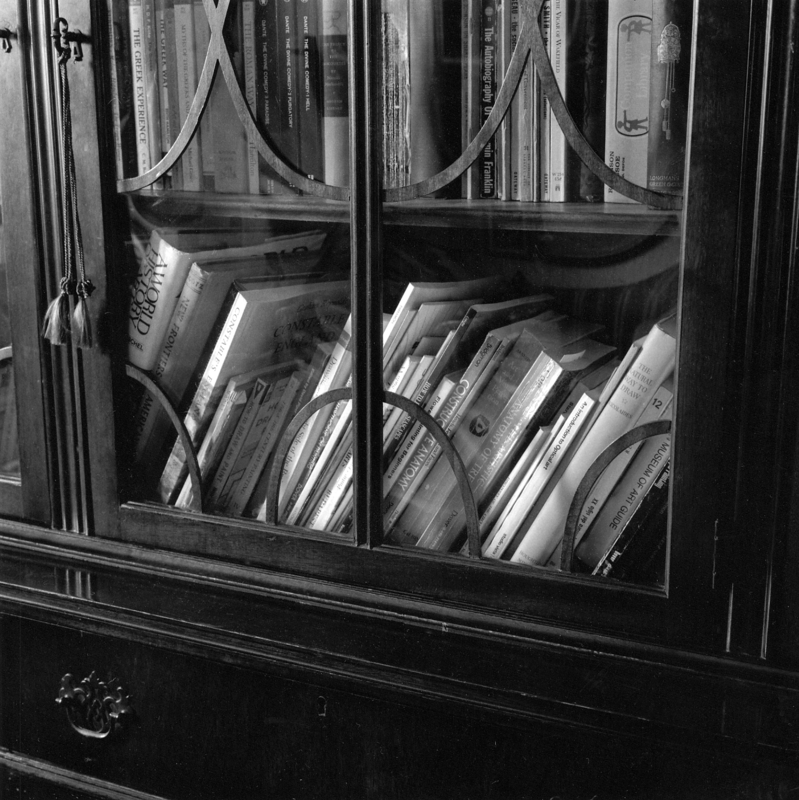 “Anne Geismar Home, Harrison, New York, 2005.” Photo by Susan Carr. And being interested can be powerful even in difficult tutoring situations, when a writer is under stress or even at a crisis point. The other day, for example, I met with a writer who was quite unhappy with both her course and her assignment and was telling herself (and me) that there was no way she could write this paper. Though she had not started drafting, she was quite knowledgeable about the topic of the course and had been doing a lot of reading. I kept asking her questions, and—despite her conviction that she could not write the paper—the writer began explaining her ideas about the role of apocalyptic rhetoric in the fall of Constantinople. (Really interesting.) As I continued asking questions, she interspersed her explanations with negative pronouncements about how she couldn’t write the paper less and less often. She started writing things down. She came up with an outline. My interest in her ideas and her situation as a writer had helped break down the negative messages she was telling herself by tapping into a powerful resource—her own interest in the topic. Being interested can help writing center tutors and leaders in their work with faculty across the disciplines as well as in one-on-one conferences with students. To collaborate with faculty and show them how to integrate peer tutoring and process-based writing pedagogy into their courses, we have to be curious about both the forms that writing takes in their disciplines and their concerns about student writing. But our curiosity also invites faculty to articulate those concerns more clearly, to be more explicit about generic conventions in their fields, and even to reflect on their own writing processes. In working with more than one instructor on a collaborative lesson plan, I have found that a conversation about student writing, the goals of the lesson, and the conventions of the discipline often turns into a conversation about the instructor’s own writing process. That is wonderful: if she takes an interest in her own writing process, an instructor is more likely to realize how integral writing is to her own thinking and, therefore, how much her students can learn through revision and a thoughtfully planned, multi-stage writing process. One-on-one conversation encourages curiosity and mutual interested-ness, mostly because when you’re talking with one person, you can’t fall back on the lecturing mode. But adept and self-assured classroom teachers also use their open-ended curiosity to motivate students and create a classroom community—and being interested can play a role in group writing center tutoring as well. Last year, Stephanie White and Elisabeth Miller piloted senior-thesis writing groups coordinated by UW-Madison’s writing center; this year, Chris Rogers and I have continued the program. Once we put senior-thesis writers in groups of four to six and give them some training in peer review, the groups become autonomous and self-sustaining, meeting on their own weekly or biweekly. 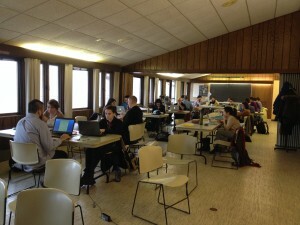 Whether a group consists of biochemistry students who had never met before though their labs are in the same building, or of seniors writing theses on subjects from French-African film to medical geography to vocal disorders in singers, these groups are held together by mutual curiosity. Writing retreat at the UW Arboretum, co-hosted by the UW-Madison Writing Center and the Center for Culture, History and Environment, November 2013. Photo by Becca Summer. And even writing-center-led writing retreats, which provide quiet, focused time to make progress on a project, are made productive by mutual interest. Each being interested in our own thing together feels different than being interested in your own thing alone in a library cubicle. 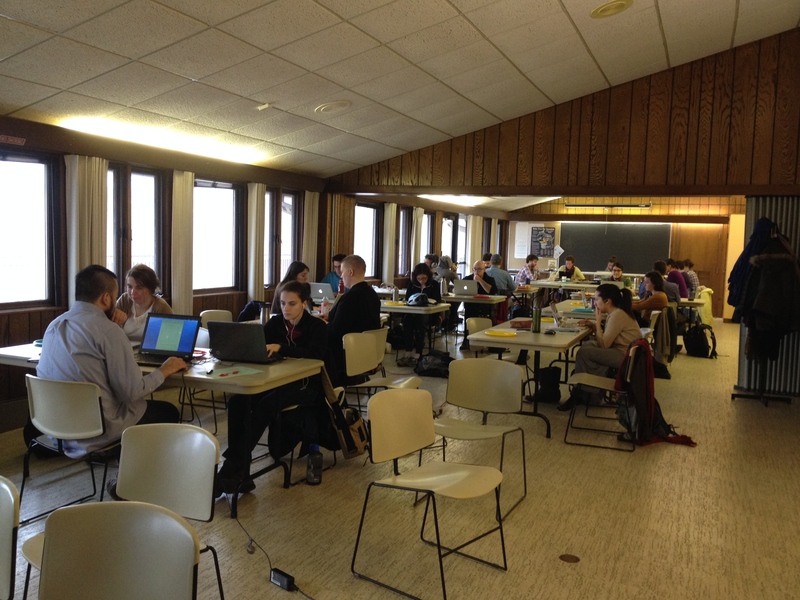 In November, I helped lead a writing retreat that was co-hosted by the UW-Madison Writing Center and the Center for Culture, History, and Environment (CHE) graduate student group. It took place at the UW Arboretum; the twenty-five graduate students in attendance were from a variety of disciplines, but knew each other through CHE. We started by going around the room so everyone could say what project they were working on. After our four-hour writing session, someone said that, though he knew in general terms about the research projects of other CHE grads, it was great to hear specifically and concretely what everyone else was working on that day. I’ve learned a lot by being interested in writers and their projects—not least how I can cultivate my capacity to be interested, and why I should. 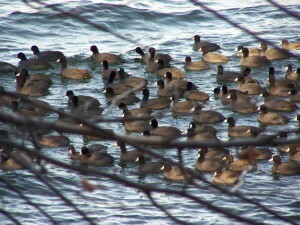 In the last two or three years, I’ve become an avid birder. I’m not the “big year” sort—I don’t even keep a life list—but I very much enjoy watching and identifying birds. And being interested in birds has made me more attentive. Coots on Lake Mendota in Madison. I’m sure that migrating loons have shown up on Lake Monona every fall and spring that I’ve lived in Madison, but it’s only in the last couple years that I’ve begun noticing them as I bike to campus. I’m sure that every December, hundreds of tundra swans have stopped off on Lake Mendota during their migration, but I’ve only begun to seek them out recently—like last week when I saw white blobs from Helen C. White Hall and walked down the lakeshore path to take a look. Coots—which my bird book calls “dumpy waterfowl”—have been riding the waves in their somehow both elegant and awkward way the whole time I’ve lived here, but now I see them. Interesting!! The first thing I’m inspired to do is look up the word ‘pedegogy’ I have an idea regarding what it means but who knows. Michelle, I love this topic, and I’m so glad you wrote about it. (In beautiful prose, too!) Every time I talk with a new tutor in the Writing Center, the first reason they give for loving the work is the opportunity to learn so much from their students about myriad topics. And the veterans cite the same reason for their continued work. It’s such a privileged position in the university to get to peep into so much fascinating work across campus. And I’ve noticed, like you have, what a powerful pedagogical tool interestedness is–showing a writer that their topic fascinates you often unlocks a whole stream of excited and productive conversation. Okay, now I’m really missing the Writing Center! I think Michelle is right that her ability to generate curiosity about what I’m doing (even when I have temporarily stopped finding it interesting myself!) has been an essential ingredient to the help she has provided me over several years now. I have often had the experience that the times that I don’t feel like coming to my appointment, because I am convinced it won’t be useful since I haven’t produced enough work to support a discussion, are invariably the most helpful appointments. That’s because, almost always, the real reason I didn’t produce more is that I was stuck, and explaining why, in response to Michelle’s friendly and interested questions, is what gets me unstuck. I appreciate your pointing out the wonderful benefits of what becomes second nature to us as writing center tutors—that being interested is part of what brings joy to our work. “High level of intellectual curiosity” must be one of the unwritten Codes of the Writing Center tutors. Really, patiently, listening to those being helped, guiding by asking insightful questions about subject matter likely far removed from what one studies, and applying the fundamentals of good writing practices (triple!) to the work of students who may have no idea of what YOU are talking about all stem from this trait and are simply the best practices of our Writing Center. And never, ever (did I say “ever”?) giving up on us! I can’t read this wonderful (and interesting!) post, Michelle, without recalling the principle of Bill Cronon’s “Only Connect” that has stuck with me so strongly: his claim that being genuinely interested in others is one of the central principles of being liberally educated. I love this reminder in December, when some of us may feel narrowed by our work to a single mode or problem of thought, that interestedness is the great power of human connection. And, as you imply here, when writers begin to sense their readers’ interest they can begin more fully to cater to it, and that is the moment when, as tutors, we reap the dividends (or interest?) of our interest. There are two risks this post makes me wonder about, though. First, what are your rules about performing interest? As someone with comparatively little expertise as a talker (Cronon would almost surely not see me as liberally educated), I have made a conscious effort to make my interest visible in conversations, but even after decades of this it doesn’t come naturally. What might the consequence of an interest that, although genuine, strikes our students as performed or inauthentic? Second, your examples here orbit around some of the extraordinary graduate writers at UW-Madison who have made the choices in their lives necessary to allow them to write about topics in which they are deeply and fully interested. But how can we use curiosity to engage some of our wonderful undergraduate writers who may feel little or no interest in an essay they have been assigned? Mike: Thank you so much for your thoughts and questions—I appreciate the opportunity to think through this with you and clarify what I wrote. I’m glad to hear you think some of the values I articulated here are in the same territory as Bill Cronon’s definition of a liberal education. You ask about performing interest and the risks of doing so in a tutoring session. I agree that interest is always performed and that not every tutor will perform it the same way—nor should they! I am an enthusiastic person given to exclamations (of all kinds, but when tutoring, I hope primarily of interest, encouragement, and congratulations), but other tutors do and should have quite different styles. I know I might get myself into dangerous territory by setting up a distinction between genuine interest and fake interest, but I really do believe that students can tell the difference between real curiosity, however it is expressed, and attempts to appear interested that rely on stock responses or adjustments in body language. And I think any tutor—even the most non-exclamatory sort—can express interest most essentially by asking good questions. Which is to say, questions that emerge from and engage with the details of the student’s draft, ideas, or talk. Not the questions we routinely ask when opening a conference, not broad questions about the student’s concerns or general questions about the course or assignment, important as those are. But questions that dig in to the nitty-gritty of the student’s thoughts about the topic or rhetorical situation of their writing. Questions we ask without any kind of follow-up advice in mind—questions that are not designed as lead-ins to where the tutor thinks the conference to go next. Questions that we ask because we don’t know the answer, and we’re interested in what it might be. That’s why I think cultivating open-ended curiosity is so important—because I can only ask questions like that when I allow myself to remember that anything can be interesting. And as for your second question about using curiosity to engage undergrads who might not be interested in the essay they are writing, I feel like it often happens that my questions give unenthusiastic writers (or even resistant ones, as I describe in the post) permission to grab hold of what they’re saying in a paper. But I’d love to hear more from you, or from others, about this—have there been times where your curiosity motivated a student? Or situations in which expressions of interest did not work to motivate a student? Michelle, I love so much about this post, but especially your observations about “Curiosity Across the Curriculum.” As you point out, “a conversation about student writing, the goals of the lesson, and the conventions of the discipline often turns into a conversation about the instructor’s own writing process.” This has often been my experience with Writing Center Outreach — there are so many moments in which I describe a writing principle or technique and the instructor says “oh, I do that all the time! 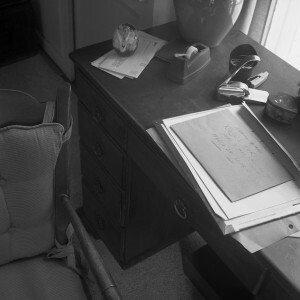 I never really realized I was doing it, though.” Becoming aware of my own unconscious processes has been such a crucial part of my development so far as a writing instructor, and it’s wonderful to be able to share that experience with other teachers. At the same time, I feel so fortunate to get to learn about the fascinating things they’re doing in their classrooms and labs — on a campus like this where so much discovery is happening every day, there’s a lot to be interested in! This post rings so true with my work in the high school library of an independent school for 25 years. Assisting high school juniors to be interested and curious about their own current issue research paper for government class requires my own patience and curiosity. Some of them are genuinely amazed to discover my interest in their chosen topic, while others definitely benefit from my questions which require them to reflect, reorganize and redefine their topic. I have not thought of my work in exactly the way you described Michelle but on a good day I would hope that I would be able to use much of what you discuss in your post. Thank you for the inspiration to be interested! Thanks for this beautifully written post, Michelle! The distinction you draw between “being interested” and “being interesting” is one I find useful. We’re often encouraged to think of our work as a unified whole, and to draw connections between our teaching and our research and our writing and our tutoring. In many ways, these projects mutually support and enrich each other. That said, it’s just as useful to consider how our different roles as graduate students require different intellectual stances. Thanks for articulating this important tension. Thanks Michelle, it’s terrific to see how the thread of (cross-disciplinary) curiosity leads into the creation of the CHE-Writing Center writing retreat at the Arboretum in November. It’s genius. The place, too, affords so many qualities for a writing retreat. I’m left wondering, too, whether the retreat produced unanticipated collaborative writing projects or even people trying out different genres for presenting their work?